I was poking around that money thing my bank manager suggested, earlier today, and discovered to my annoyance that there is a fee. I have a knee-jerk hatred of banking fees - if a bank account requires a minimum balance for the monthly service fee to be waived, I consider that minimum balance to be 'zero', the amount of money I must not spend beyond. That Mr Bank Manager didn't mention that there was a monthly fee on that sort of account irks me quite a bit. But here's the weird and broken thing - if I had $3000 to put in an interest-bearing account, I would rather get a 3% interest rate and not pay a monthly fee ($7.50 interest a month) than a 4% interest rate with a $2 monthly fee ($10.00 interest a month, so $8.00 overall), even though that actually would mean I get 50 cents less per month (not to mention the interest on the interest which means this gap widens as time passes). The knee-jerk anti-fee reaction is that strong. Part of the reason for this is carried over a dislike of checking account fees because there were none when I was younger, so their introduction was about as welcome as a reasonless tax increase. The other part of the reason is something more visceral - if they're just paying me less interest then they're not touching my money, but if they're paying me more interest and then taking a fee then they're sticking their grubby little fists into my imaginary box of money, and then they're pulling out a handful and throwing it in the air and laughing about it. And they're doing this with everyone's money, and making a big Scrooge McDuck swimming pool of it, and probably weeing in the shallow end. Tsk, more movie reviews - do I do nothing else? To break up the monotony a bit, I shall first tell of an amusing juxtaposition of advertisements. First was an ad for Dove chocolate, which tells us something along the lines of "work is boring, clothes are boring, sleep is boring, life is boring... but chocolate shouldn't be boring!" The ad shows people being sad and bored in any non-chocolate situation, including having just run out of chocolate. Immediately after that ad was an ad for depression. Well, an ad against depression. One of those public service "depression is the silent killer, find out what you can do to help" sort of things. Presumably what you can do to help is buy sad people chocolate. The movies! First was Osaka Wrestling Restaurant, which doesn't seem to have an IMDB entry. After a very promising start, the movie was a bit of a let-down. The diverting sideplot that we're introduced to the movie with remains amusing throughout, but only occupies about eight minutes of the movie total. The primary plot is passable enough, but implemented with too little action, too much emoting. It ends up feeling more like a soap opera than a movie. The other was Moon Warriors. A bit disappointing in that I'd seen the majority of the eye-candy before in the form of trailers. Probably not a bad movie to see if you thought Crouching Tiger, Hidden Dragon was the bee's knees - the wire-fu is similar, the dubious plot is similar, there's less fire but more water. But I'm going to ruin the end for you first, since there is only one thing that's really notably unusual about the movie. The plot is a fairly standard swashbuckling "brothers competing to be king, the evil brother has the majority of the power" situation. The good brother is fleeing. He has a female companion who turns out by the end to have been a baddie but to have been converted to the side of good by virtuousness and nicety. They bump into a peasant who is our primary hero. The three of them go to get a princess who is the good brother's girlfriend, largely for the sake of power-consolidation; the girlfriend works out but the power consolidation doesn't. So now we have four good guys versus the bad guy and his army. Now this is the good bit. The bad guy's army pretty much gets wiped out, and the goodies take on the baddie one by one. First the baddie kills the good-brother, then he kills the princess, then he kills the double-traitor-woman. Then we get the unusual twist - he also completely kicks the arse of our peasant hero. Then the peasant hero's friend slaps the bad guy down. With its tail. Because the peasant hero's friend is a whale. Another triumvirate of movie reviews. From the Hong Kong DVDs section, we first have Last Hero In China, a Jet Li movie of Wong Fei Hung. Unlike his other Hung movies, this one is quite fun, quite silly, and quite possibly packed with in-jokes I didn't get. The sort of silly is best described by example - a dying person tries to tell people the secret he has discovered, and they clap a hand over his mouth and won't let him speak because "in movies an injured person always dies right after telling the secret". The movie follows a fairly common old-school Kung Fu plot, with a baddie doing an animal-style of kung fu that beats the hero's animal-style, and the hero then seeing a different animal beat the animal that the baddie was doing, and making up a new kung-fu technique based on the winning animal. I think, in this movie, the plot was supposed to be something of a parody of itself, as Jet does rooster style kung-fu to beat up a giant centipede. Rooster style kung-fu involves having metal claws on his feet and a pointy beak strapped to his head. Also from the Hong Kong DVDs section is Zu: Warriors from the Magic Mountain. The first part of this movie is fantastic, feeling reminiscent of a cross between Rosencrantz and Guildenstern are Dead and Red vs Blue. The two seemingly-main characters seem amusingly adrift and pragmatic. "Whose orders do you obey?" "Er. Both of your orders?" "Insubordination! Kill him!" "No, wait! Um. Neither of your orders?" "That's even worse!" Unfortunately, after a promising and entertaining beginning, the movie somehow wanders off and turns into a movie one should only watch on some sort of hallucinogen. Swirly vortices abound, along with magic sparkly swords and drawn-onto-the-film-with-a-felt-tip-pen "blood crows". It's still moderately entertaining, but not nearly as good as it would have been if it had stayed with the "cowardly nonentity caught up in a plot he has no control over" archetype. And not from the Hong Kong DVDs section, but quite thematic all the same, The Last Samurai. Not as boring as I expected, but still fairly boring. The most notable thing about the movie is that, even though it seemed to be intended to endorse the way of the samurai, it caused me to lose all respect for them. It seems to me that the samurai in the movie didn't understand their own code. Their refusal to adapt to the use of guns was puerile tradition-for-tradition's-sake. The way of the samurai wasn't really about being excellent at swordplay and archery, it was about being excellent at whatever you do, and they had lost sight of that. A lot of people think that a gun is the great equaliser - that anyone with a gun is pretty much as good as anyone else with a gun - but that this is not the case can be very easily seen in the result of a game of paintball, twelve against one where the twelve have the advantageous position and are regular paintballers (so not entirely incompetent or unpracticed), but the one is a trained special forces expert. You can infer the result of this match from context. By the numbers it's not unlike any other martial art - one very competent person can defeat an almost unending stream of amateurs. There's the "guns are dishonourable" excuse, but that holds no less true for arrows. There's certainly no dishonour in using the same weapon as your opponent. I can see how one might frown upon a ninja as dishonourable for using whichever weapon is most efficient - I'm sure a ninja wouldn't hesitate to use a machine gun against an army armed with bendy straws if that was his battle - but that doesn't make the machine gun dishonourable, even if you do have a silly code of conduct, it just makes the mismatch dishonourable. All the movie samurai did by insisting on using only bows and swords is force their opponents to be dishonourable by a code of conduct they didn't adhere to. Which is stupid. And I don't think "being stupid" was part of the code. This morning, the manager of my bank branch called. He wanted to discuss things and see if there's anything they could do for me. There are two things that should be noted about this occurrence. The first thing is that I have quite a lot of money with that bank, which is tentatively earmarked for buying a house in a year or two with minimal mortgage-rate compromise. The second thing is that this is the bank whose advertising slogan is along the lines of "we'll treat your ten dollars like other banks treat a thousand". I'm pretty sure the bank manager hasn't phoned people who have accounts with under a thousand dollars in them. Still, I suppose they do treat the money the same, just not the customer, so the slogan isn't strictly false. The bank also has posters on the wall saying something about "treating your money seriously", with a big picture of money with groucho nose-glasses drawn on it. Personally, I would rather my bank draw groucho nose-glasses on all my money, rather than treating it seriously. It'd be great to buy a house with cash, in the form of tens of thousands of ten dollar bills all of which have groucho nose-glasses drawn on them. Anyway, Mr Bank Manager asked me to come by to talk to him and have a cup of coffee. Since I have quite a bit of money idly earning very little interest, and had some questions about house-buying in a year or two, I went along. Unexpectedly, there were some things worth doing, so I will be shuffling some money around soon. But, along with the rest of the post so far, that's not the point of the story. A triumvirate of movie reviews. The cinema told us again that making digital copies of data is exactly the same as removing physical objects from people's possessions. Lies! By way of revenge, we left the cinema with low-resolution highly compressed copies of the movie stored in our biological RAM disks. They didn't think to check inside our heads for recording implements, the fools. The first movie watched was Equilibrium, which was moderately entertaining but tremendously frustrating as a waste of a fun idea. You can have people kung-fu shooting with any plot - there's no call for wasting a post-apocalyptic society mandatorily drugged into emotionlessness on it. Not that I would object to a good movie about said post-apocalyptic society containing karate gunplay, but this wasn't a good movie about the removal of emotions, in that most of the characters spent the whole time expressing emotions they weren't really supposed to have. Not quite as bad as it seemed, as in the end it turns out that pretty much all of the major characters have been off the mandatory drug the whole time, but the presentation of the dystopia is totally lost behind the martially artistic projectile-launching. And the kung-fu marksmanship is mostly only entertaining in its abject silliness, a fact which, admittedly, the movie uses to its advantage in at least two scenes. And there are trenchcoats. Then there was Spiderman 2, which is excellent. The portrayal of the mundanities of superhero life in the first segment of the movie was lots of fun, Doctor Octopus was acted and animated fantastically, and there was some delicious foreshadowing of some characters likely to appear in the next movie. Unfortunately, there was also some foreshadowing not nearly so subtle which was gibbering about how the main villain will be the Green Goblin Version 2.0, which is a shame since the Green Goblin is the crappiest villain there is. Not that Spiderman has any really good villains other than Mr Octopus. Aside from the implication that the next movie will feature the crappiest villain, the only major objection I have to Spiderman 2 is that there were a few too many clumsily done emotional scenes. People who shared the cinema with us chose these scenes in which to go to the toilet, which is a fairly good indicator of how bad the scenes are. Oh yes, and the other annoying thing was that they spelled "Doc Oc" as "Doc Ock". Google-count sides with the movie, as does a cartoon; I'm not sure whether the original comics did, but if they did then they're wrong too. He's Doctor Octopus, not Doctor Ockham. Though that would be pretty cool too. Observe! 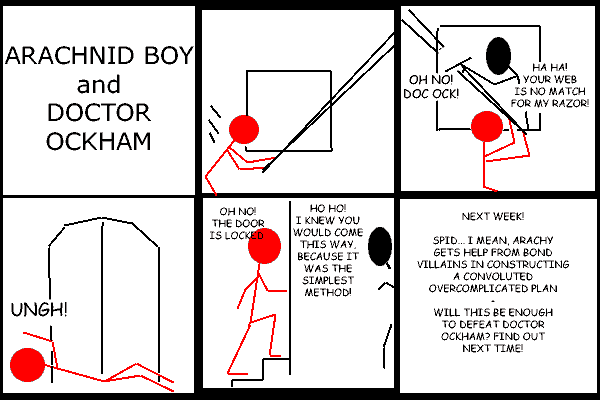 Anyway, as I was saying before I went insane and decided to actually draw a Doctor Ockham cartoon, albeit desultorily, um, Spiderman 2 is quite good. Yes. Australian TV has done another televised test, again with a website that struggles to provide a connection let alone data before the connection times out. This time it was the Living Longer test, calculating people's lifespans based on approximately the criteria that insurance companies use. As well as an insurance company, the test was sponsored by red meat and Nicorette, which was fantastically evil - immediately after the show's "here's what you can do to improve your score in this section" there would be the horrible deceptive (though literally accurate) ad stating "Red meat is part of a healthy diet. Healthy diets are part of why we live 23 years longer now than [at some time in the past]." In the test, one would also get 5 life points for eating lots of fish, not taking into account that several types of fish are especially high in essential vitamins and minerals such as delicious delicious mercury, and also not taking into account that much of the beneficial stuff from fish can be had from flax seed or flax oil. So that speaks well for the accuracy of the test. What did I score on the test? I have no idea. Instead of sitting on the couch (no exercise, bad for your health) watching crappy TV (very stressful, waiting for them to bloody hurry up with the next section - they stretched it out over about 2 hours when it could easily have fit in 20 minutes - and stress is bad for your health), I went and made a delicious healthy curry. It was healthy even though it didn't have any red meat, fish, or Nicorette in it. The new Around the World in 80 Days is fun, and extremely silly. In tone it resembles a live-action episode of Clone High, starring Jackie Chan as Joan of Arc, and Phileas Fogg as JFK. There's not really much more that can be said about it without jumping knee-deep into spoilers. There's a good number of director-level jokes - non-obvious jokes that aren't so much made as just exist. Guest stars include Richard Branson as owner-of-a-hot-air-balloon, and one of those narrow bench thingies as Jackie Chan's favourite weapon, borrowed from every old-style Jackie Chan movie there is. The best meme invention ever, from the combined brains of RavenBlack and several_bees, though I'm a bit sceptical about its likely success rate. In Imaginary World, you are offered $100,000 for each of your acquaintances that you sleep with. People you already sleep with are excluded from play; people you have slept with before but now don't are allowed. All acquaintances are, regardless of whether this is true in Real World, willing, disease-free, and of appropriate gender-preference. You will be sleeping with them consecutively, so by the time you get to the fourth-favourite you already have $300,000 (which may affect your willingness to continue). If your list reaches 20 people, stop there. The partners are not guaranteed to be automatically sane, so if they're likely to fall in love with you as a result and that would be awkward, bear that in mind. Give the list of people in order (you don't know for sure that you won't be yoinked back to Real World before you're done, so make sure you get your favourites first). If you would rather not play along with actual names, give the shortest description that identifies them uniquely to yourself (or a more obfuscatory one if you're still leery). Today I've been digging around in various conspiracy theories, and have come to the conclusion that conspiracy theorists need to beef up their campaigns somewhat. The problem for conspiracy theorists is that they believe there is proof for their claims, eg. "Any American official wishing to challenge this has only to subpoena the telephone company and Justice Department records. There will be no phone charge originating from American Airlines 77 to the US Solicitor General." But who is allowed access to phone records? Not the conspiracy theorists, certainly. The FBI, NSA, CIA, other TLA, and police if they get the paperwork, but there is no way for your average conspiracy theorist to get this evidence. They genuinely believe there is conclusive evidence available, but have no conceivable way to get at it. So what can they do? The answer is simple - fight fire with fire. It's not like any of the information the public is given is true, so why does the information from conspiracy theorists have to be? Rather than saying "if you subpoena the phone records you'll see no call was made", say "click here to view the phone records" and link to a page of data that looks plausible, with highlighted bits where the missing phone call isn't, or, if you want to argue that there was a phonecall, highlight the bit where it is instead. Clearly whoever gets their evidence to the public eye first wins, no matter whether it's real. If the first evidence you saw after 9/11 was "that phone call the woman made was faked, look, here are the phone records" and a week later an FBI press release said "those phone records were forged, look, here are the real ones" which would you believe? I demand better-prepared conspiracy theorists. They should have their explanations ready before the event happens, with pictures and other documentation, just like the official story does. The most important thing, however, is to always tell the viewer what they see in a photograph, like CNN do. I would never have believed that these pictures are "a series of photos taken by a security camera that show the fireball from a hijacked airliner crashing into the Pentagon on September 11" if I hadn't been told, given that they used completely the wrong scale for showing a 757, were timestamped the wrong time on the wrong day (timestamp not shown in CNN's copy), and show time passing at an inconsistent rate. Luckily, the conspiracy theorists are already pretty good at the "tell the reader what they're looking at" part of propaganda. A chap with unusually good analogies explains compellingly why free energy is possible. The most notable part of the explanation being one of the analogies, and an unmentioned corollary. The corollary should go first, I think - that while people who strive for such devices sometimes say "over-unity" and "efficiency greater than one" they don't mean it. There is a distinction being missed, between efficiency - that property which, in physics, can never be greater than one; energy input over energy output - and COP - energy input by the operator over energy output. Then we get to the analogy, which makes this distinction clear - windmills. The criteria people apply before they say 'pah, bunkum' to claims of 'over-unity' devices are such that they would say the same about windmills. Look at my imaginary windmill - here is an ammeter and voltmeter attached to my input-side battery, showing an unfeasible zero, and here is the ammeter and voltmeter on the output-side - gasp! There are some volts and amps! That's over-unity, so there must be some fault in my measuring apparatus or I must be faking it! Indeed, the 'efficiency' of my windmill is infinite! Ah, you say, but there's another input, the wind. Well that's what over-unity people say, too. They say there's another input; vacuum energy, or gravity or magical magnets or whatever thing they feel like, really. Show me this wind of which you speak! Surely you're using it up and it will run out so the machine will stop working! And so forth. Why is wind a more feasible renewable energy source than magnets or gravity? 'Permanent' magnets don't wear out their charge, they just deteriorate with time - the rate at which they deteriorate isn't changed by how much work they do. The problem with magnets is that they apply a force contrary to the one you want to apply to your engines, as well as the helpful one - but if you can change that without having to put more energy in than you save by doing so, your machine is sorted. Can you? I don't know.